Abigail Walthausen explores the life and work of Arthur Heming, the Canadian painter who — having been diagnosed with colourblindness as a child — worked for most of his life in a distinctive palette of black, yellow, and white. Postmen of the Wilderness by Arthur Heming, first published in his Drama of the Forests (1921) — Source. 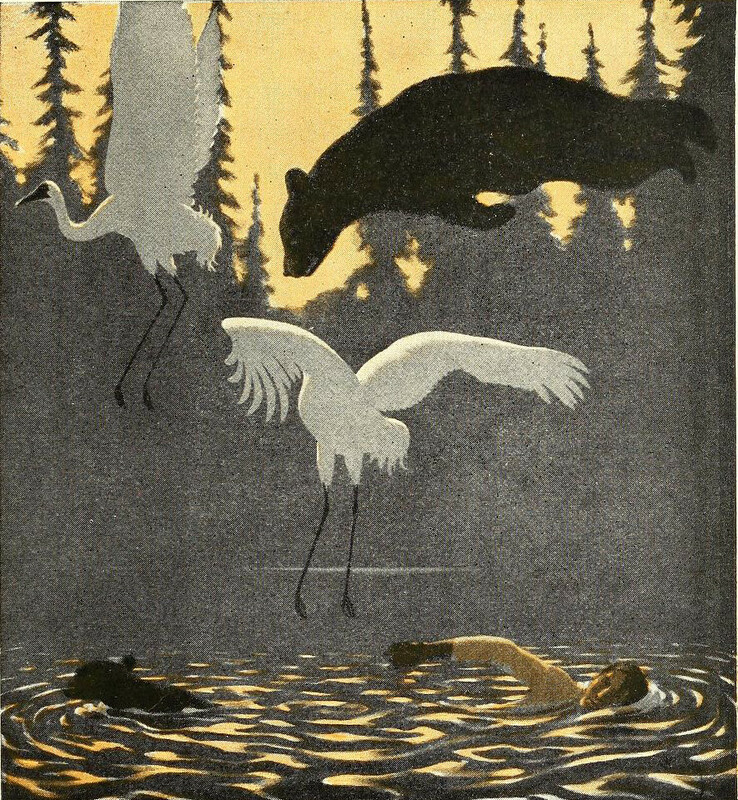 For most of his life, Arthur Heming, “painter of the great white north”, painted in a monochrome scheme of black, white, and yellow tones, choosing this style at least nominally because of an early diagnosis of color blindness. These possibly self-imposed restrictions lasted inexplicably until the age of sixty, when a full, nearly technicolor palette suddenly splashed across his canvases. Thematically, he worked with scenes whose colors were appropriately blanched: winter hunting and trapping expeditions that he took for the Hudson Bay Company and alongside people of the First Nations. His narrow focus in painting mirrored his work as a traveler, novelist, and illustrator, and the commercial nature of his output certainly influenced the mixed reception he received in the art market. In Canada he existed as an outsider of both the trapping communities he traveled with in the north and of his peers in the fine art world. His best work is transcendent, calling to mind the rich velvety grayscale of Gerhard Richter’s realistic paintings, while his weakest work is the sort of mystic wolf lore that later became the vernacular of furry bedspreads and black crewneck sweatshirts. Heming was conflicted about both his place in his homeland and his status as an artist. This is perhaps why he was so eager to find an adopted home for many consecutive summers in a distinctively non-arctic landscape, a farming community on the Long Island Sound, Old Lyme Connecticut. While the Florence Griswold artist colony in Old Lyme Connecticut is generally touted as the “birthplace of American Impressionism”, Heming left a few distinctively Canadian marks on the communal dining room. First, there is his contribution to the collection of panels painted by artists who resided there; his, which depicts a lone canoe flying over rapids as seen from above, stands out from the rest because of its stark black and white color scheme and the narrow focus of its detail. Rather than a miniature painting of the pastoral Connecticut landscape, his seems like a snapshot of a larger, wilder, uncontainable narrative. 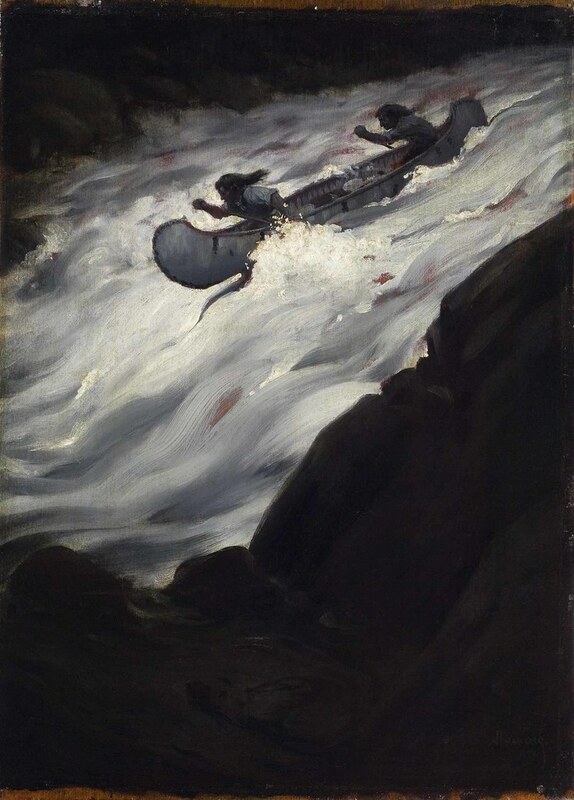 Shooting Death’s Rapids (1906), Heming’s contribution to the dining room panels at the Old Lyme artists’ colony — Source. Both Heming’s work and his image are featured in Henry Rankin Poore’s 1905 frieze-like painting Fox Chase. All of the colony’s frequent residents appear in this painting as caricatures of their roles in the community. Childe Hassam is depicted shirtless and playing a prank, while Mathilda Brown, the sole female painter in the group, is filled with ladylike shock. Heming himself is depicted as a proper Canadian mountie, standing above the action. So while Heming’s painting sticks out like a sore thumb, his own caricature blends quite nicely into the scene depicted. He is both part of the community and an observer. 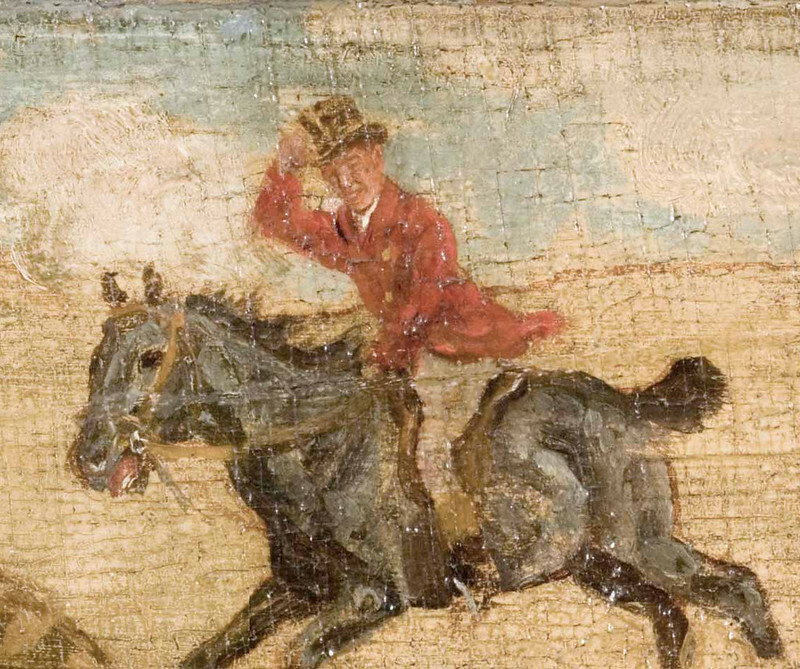 Heming as mountie on horseback in The Fox Chase — Source. The “Hot Air Club”, ca. 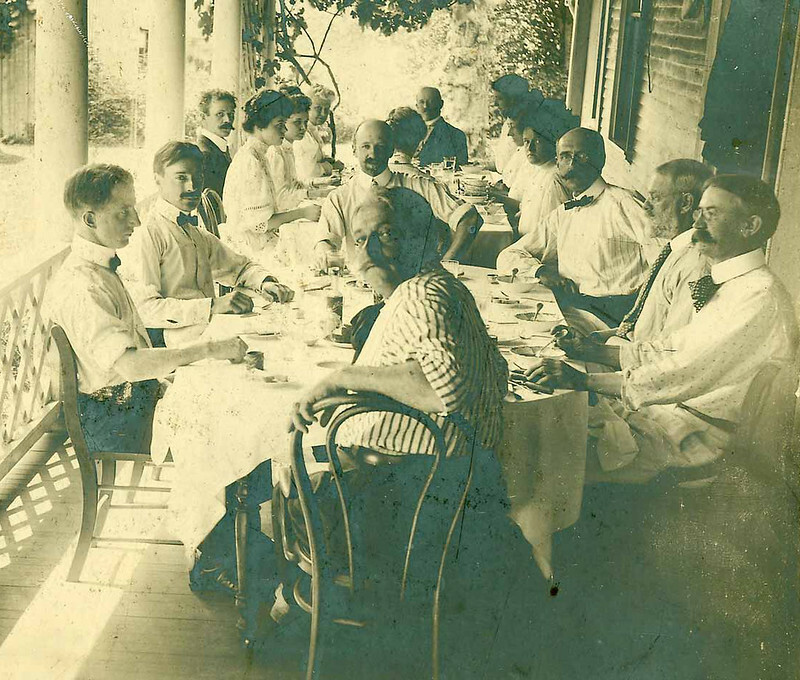 1903, a group of artists who regularly took their meals on the porch at the Griswold House in warm weather. Arthur Heming is seated to the front left — Source. While many of the other artists in the mural are either painting en plein air or interacting with one another, there is no evidence that Heming did any painting at all while at the colony. Instead, he worked on his writing, both to create narratives around the paintings he had done on his travels and to record the life of the vibrant communities he had traveled and lived among. At the colony he wrote Spirit Lake, a book he began after illustrating many of the wilderness adventure stories of others, whose expertise he often found lacking. In all three of his wilderness novels, Spirit Lake (1907), Drama of the Forests (1921), and The Living Forest (1925), Heming delves with great detail into the relationships between people and animals on trapping expeditions. Oil painting, used as an illustration for The Living Forest (1925) — Source. In spite of its title, Drama of the Forests is quite drama-free. While some hunting scenes involve action, he spends far more time giving detailed descriptions of the variety of animals he encountered in the north. There are the playful otters, the rabbits, whose fresh, untanned pelts make the best socks for trekking, and the mystical beaver, whose dams keep the soil nutrients from being swept away to those “highwaymen”, the major rivers, and out to sea. Nor does the “drama” exist with the people he encounters. He believed quite strongly that guns had no place in the Northern territories. Both in his art and in his writing, the danger is mutual when humans and animals come together in the hunt. When he describes a mother and daughter killing a bear mid-stream, he writes “Their hearts were fired with the spirit of the chase, and — though their only weapons were their skinning knives — they felt no fear”. Conversely, when he comes across a visitor to the northland, he is dismayed by his weaponry. At one post I visited years ago — that of Abitibi — they had a rather progressive addition in the way of a millinery department. It was contained in a large lidless packing case against the side of which stood a long steering paddle for the clerk’s use in stirring about the varied assortment of white women’s ancient headgear, should a fastidious Indian woman request to see more than the uppermost layer. Heming himself stuck to the “uppermost layer” in his writing: just as much as he avoided modern weapons, he avoided modern conflict as well. He had no interest in exploring exploitative practices between the Hudson Bay Comapny and trappers or racial conflict, though he took on a voice that was neither traditionally colonial nor progressive. 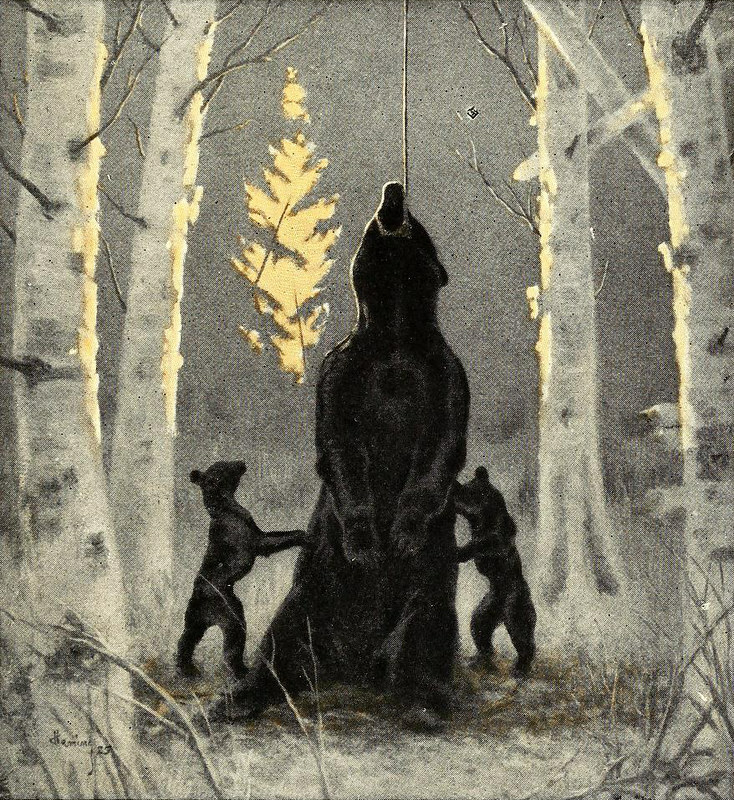 Return of the Head Hunter, an oil painting for Drama of the Forests (1921) — Source. Heming, it is clear, was very concerned with simplifying and humorizing the complexities between people wherever he was. Although he never wrote about his experiences in Toronto, London, New York, or Paris, he lavished attention on the community of Old Lyme, writing two books about the summers he spent there between 1902 and 1909. He believed himself to be recording in an anthropological sense, and this showed in the fact that his approach to descriptions of people and their habits was much the same when he visited Old Lyme as when he wrote about trapping expeditions. In his unpublished volume about the colony, “The Lady in the Lion’s Den”, he reverses the idea of the exotic when he writes “we are always hearing, or rather reading, about Americans in that God-forsaken region, but never about a man from Hudson Bay exploring the wilds of New York City or the villages of New England”. His love of humor comes up again and again in his Miss Florence and the Artists of Old Lyme: he describes awkward romances between residents, the scattered housekeeping of the hostess, and the pranks he claims himself to have played on Woodrow Wilson during his visit (apparently substituting wood wool, a byproduct of the logging industry used for packing, for Wilson’s much-loved shredded wheat breakfast cereal). Why was Heming able to find such an affinity for subject matter so far from his own intense wilderness paintings and narratives? Although he wrote and painted a land that many considered “wild”, essentially his subject matter was not a barren landscape, but the communities and traditions that he found while traveling through “the great white north”. Despite overlapping styles and subject matter, this tendency placed him worlds away from the contemporary artistic trends of his homeland. The painters known as the Group of Seven dominated the art scene of Heming’s day, and unlike Heming, they were much more interested in portraying an uninhabited northern landscape. Artists like Lawren Harris and Tom Thompson took expeditions to many of the same Northern regions, but they did not study the lifestyles of survival there. They saw grand empty expanses and saw them as symbols of purification and redemption in the modern world and hope for the relatively new Canadian nation. Harris believed that because of the northern wilds, newly independent Canadians were better equipped than continental Europeans to lighten the “heavy psychic blanket” of modern society. In much the same way that Heming found the interaction of human and animal life to be the great appeal of nature, the artists of Old Lyme were conscious dissenters from the romantic tradition of the Hudson Valley painters who were committed to showing nature in its sublime, untouched beauty. The American Impressionists who populated Florence Griswold’s community were much more interested in an American heritage populated by farmhouses, villagers, and livestock (several residents at the community specialized in painting cows). Both Heming and the Canadian Group of Seven had a great affinity for the work of the transcendentalists as well as surprisingly similar motifs in their attempts to spiritualize nature. In fact, as painters like Harris moved further into theosophy and abstraction, the work resembled Heming’s clean lines and monochrome more and more. But though Heming did render his natural settings with streamlined and perfected imagery, the great simplicity with which he imbued nature was much more inspired by the arts and crafts philosophy of seeking the greater truths in design. After some early disappointment in art school wherein he decided he was “deficient in sense of decoration”, Heming sought out the arts and crafts school, going to England to study with Frank Brangywn, a painter who had worked under William Morris. Unlike the Group of Seven, who wanted to claim the Canadian wilderness as a symbol for Canadian patriotism by erasing all life there, keeping it a blank canvas, Heming wanted to claim that idealized land by making both landscape and life decorative — in a sense, by preserving it in black and white. An oil painting featured in The Living Forest (1925) — Source. 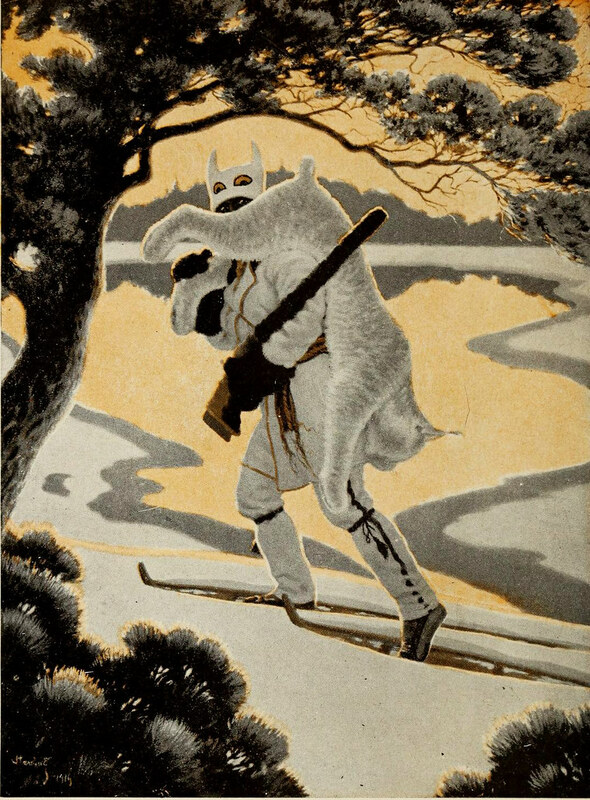 Lynx Hunter, a painting for Drama of the Forests (1921) — Source. It was an amusing yet interesting performance. His maiden speech I believe, and he was bashful and shy as a little girl; and so rattled that when the chairman finished his introductory remarks, Gilmartin, clapping his hands wildly, joined the crowd in applauding his own introduction. Needless to say that brought down the house, for the audience, it seemed, imagined they had discovered a second Mark Twain. …He concluded in a flash that the only way to save the train from total wreck was to use the weight of his body in balancing it, just as he used his body from side to side, as the train rushed around endless curves, and when daylight appeared, he landed it safely at the station in North Bay — just as he had landed many a precious cargo of furs when shooting his canoe through ‘white-waters’”. Heming’s love of decorative and simplified imagery may have steered him away from taking any artistic risks with color early in his career. His colorblindness may even have been a shield against the frequent accusations by critics and the Group of Seven alike that his work was too commercial, cartoonish, and even American. Towards the end of his life and without much explanation, Heming threw off the limitations of his possibly assumed colorblindness. The paintings of his final decade are vivid, nearly technicolor. At this late stage in life, Heming did receive recognition from a major Canadian museum, the Royal Ontario Museum; however, the recognition came through the wrong channels. This full-color trapping series was not acquired by the fine arts branch of the museum which displayed the works of the elite Group of Seven but by the natural history branch. Even there, the paintings were not fully welcomed. Two museum directors butted heads about the paintings — one arguing that the depictions of nature were subjective and unscientific, the other that they would be a useful part of the trend to activate and contextualize nature scenes for the general museum audience. In 1962, though, the issue became moot when the series was moved to the most appropriate of the ROM’s collections, the Canadiana Collection. 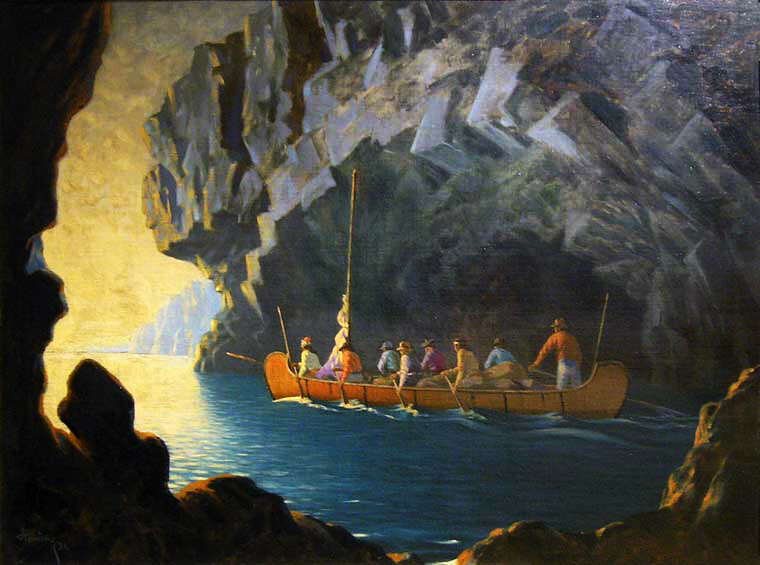 Canadian Pioneers (1931), one of Heming’s later color works — Source. Heming did not live to see this resolution nor did he have a chance to weigh in on the final home for his work. However, art museums had never been the preferred goal for his paintings: years before his death he had put much effort towards selling his work into the private holdings of the Hudson Bay Company. This unsuccessful attempt speaks to his vision of himself as first and foremost a contributor to the history of Canadian wilderness exploration. Ultimately, the fact that his last series of paintings spent so much time in limbo before resting in a place where they were welcomed seems a fitting parallel to Heming’s life — a life spent in uneasy navigation through Toronto, New York, Old Lyme, and the Great White North. 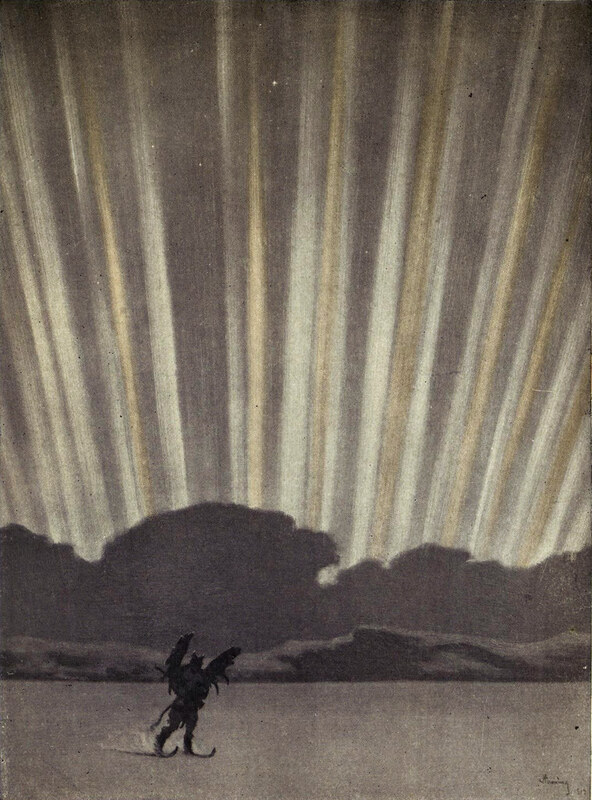 Spirit Lake (1907), by Arthur Heming. Drama of the Forests (1921), by Arthur Heming. The Living Forest (1925), by Arthur Heming. 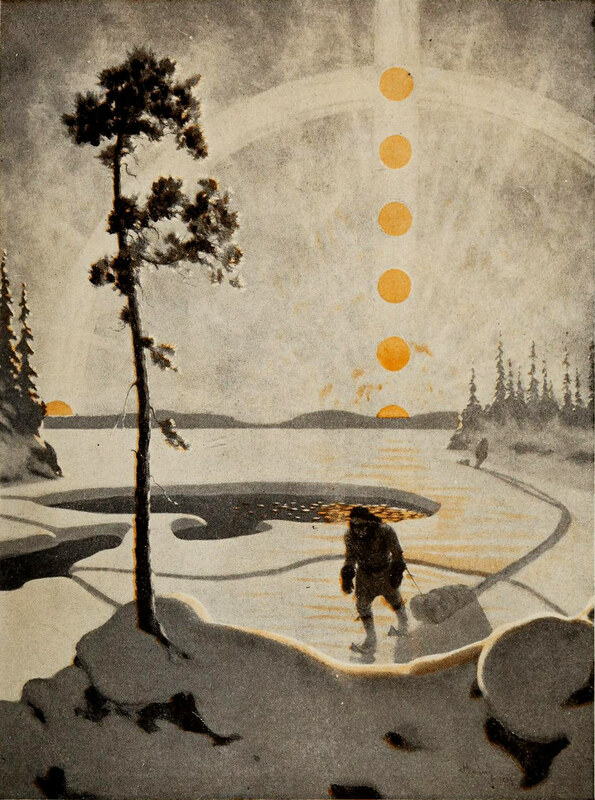 The Heming Paintings of Northern Life (1923), booklet of plates from Drama of the Forests, produced by Royal Ontario Museum of Zoology, by B.A. Bensley, director. Marylin McKay explores the history of Canadian landscape art, analyzing it in relation to various concepts of territory and identity.